Don't adjust your monitors! This is a very green post! I first learned about matcha from Celine of Have Cake Will Travel. I mean, I'm not dumb...I have had green tea before, but I had never heard the term matcha before. After a little investigation, I realized that people either love it or hate it. There are really not a whole lot of people that are in the middle on this. After some searching, I found that a couple of friends of mine had some that they graciously loaned to me! So, now the adventure begins...I have found a few recipes that I am interested in trying, but on this occasion I thought I would try this cookie recipe I found on Smitten Kitchen for green tea shortbread cookies. It just so happened that it was my friend, Stein's, birthday and she was the one that gave me the green stuff. I have to say, that I made a little mistake and used granulated sugar instead of powdered (I had to add 2TBSP soy milk because it was crumbly) and I scooped them instead of rolling them out to save on time. I had this really cute porcelain Chinese takeout container that I thought was completely appropriate to use for this occasion and the gift was complete! aww, and thank you for your comment on my blog - you're right! it's about being with those you love, not necessarily if you're in a relationship. I used to really dislike matcha but then grew to love it. 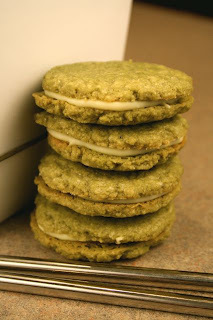 I've tried making matcha shortbread a couple of times but still need to find a recipe that works as I want it to. Your cookies look delicious! If you have a few minutes to spare, could do us a huge favor and read the article and comment at the bottom of the page? We're very excited about getting such great press, especially from a magazine of this caliber. If everyone drops by and leaves a quick comment, soon there will be no doubt in any publisher's mind: YES, readers absolutely do want to know about vegan happenings and developments. Please don't hesitate to repost the article on your blog and spread the world! I am so jealous! 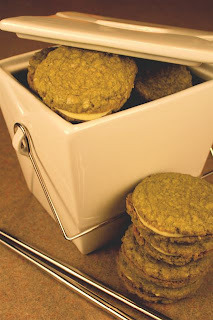 I gave green tea cookies a try this past week...and blah....a terrible vegan disaster. Where did you take your recipe from? They look great! !